A team of speleologists has discovered new galleries and animal species during their research in the Maja Harrapit (Arapit) Cave, located on the foot of the wall of Maja Arapit Summit in the Albanian Alps. During their month-long work, the team has discovered and mapped new vertical galleries in the cave, which have increased its length and its development in height, putting it among the largest caves of this kind in the world, Aleksey Zhalov from the Bulgarian Speleology Federation, which coordinates the team, told national media. According to Zhalov, zoological research was also carried out, which yielded finds of new animal special. 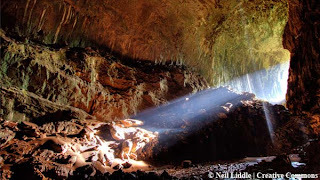 The Maja Harrapit Cave was first explored in the 1970s by Albanian cavers. It was mapped during the first Bulgarian–Albanian expedition in 1992, when 512 metres of cave passages were surveyed. Since then, the team of Albanian, Bulgarian and other speleologists has been researching the cave annually and continue to discover new parts of it.